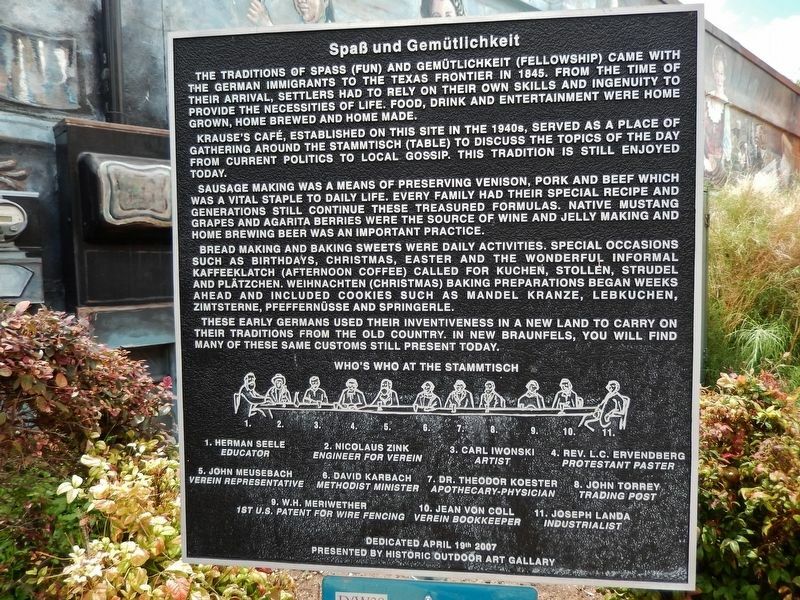 The traditions of spaß (fun) and gemütlichkeit (fellowship) came with the German immigrants to the Texas frontier in 1845. From the time of their arrival, settlers had to rely on their own skills and ingenuity to provide the necessities of life. Food, drink and entertainment were home grown, home brewed and home made. Krause’s Café, established on this site in the 1940’s, served as a place of gathering around the stammtisch (table) to discuss the topics of the day from current politics to local gossip. This tradition is still enjoyed today. 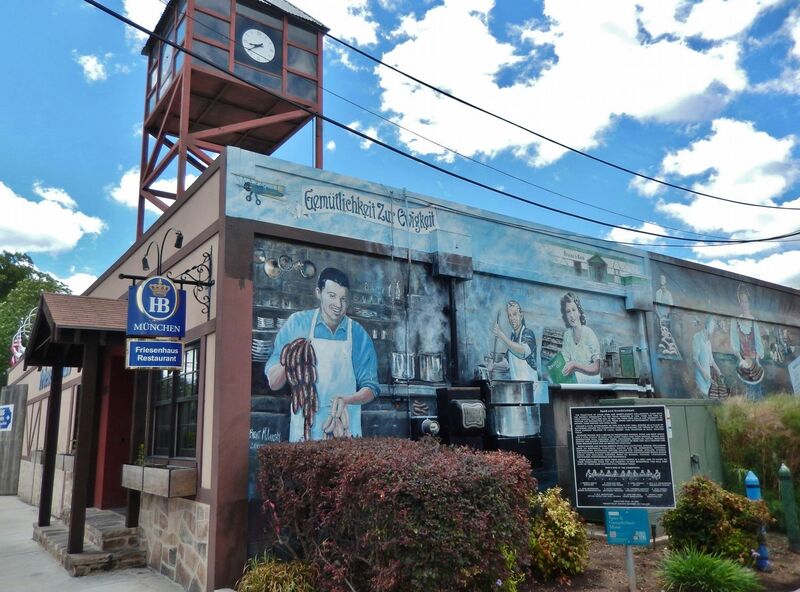 Sausage making was a means of preserving venison, pork and beef which was a vital staple to daily life. Every family had their special recipe and generations still continue these treasured formulas. Native mustang grapes and agarita berries were the source of wine and jelly making and home brewing beer was an important practice. baking preparations began weeks ahead and included cookies such as mandel kranze, lebkuchen, zimtsterne, pfeffernusse and springerle. These early Germans used their inventiveness in a new land to carry on their traditions from the old country. In New Braunfels, you will find many of these same customs still present today. Who’s Who at the stammtisch. Erected 2007 by Historic Outdoor Art Gallery. north wall of Krause's Café. Marker is at or near this postal address: 148 South Castell Avenue, New Braunfels TX 78130, United States of America. Touch for directions. Other nearby markers. At least 8 other markers are within walking distance of this marker. Hinmann House (within shouting distance of this marker); Plumeyer Bakery Building (within shouting distance of this marker); Louis Henne Co. (about 400 feet away, measured in a direct line); New Braunfels 1918 Fire Station (about 400 feet away); International & Great Northern Railroad in New Braunfels (about 500 feet away); Main Plaza Bandstand (about 500 feet away); Site of Old Schmitz Hotel (about 500 feet away); 1915 New Braunfels Post Office (about 600 feet away). Touch for a list and map of all markers in New Braunfels. Also see . . . New Braunfels Historic Outdoor Art Museum. More. Search the internet for Spaß und Gemütlichkeit. Credits. This page was last revised on December 11, 2017. This page originally submitted on December 9, 2017, by Cosmos Mariner of Cape Canaveral, Florida. This page has been viewed 120 times since then and 11 times this year. Photos: 1, 2, 3, 4, 5. submitted on December 9, 2017, by Cosmos Mariner of Cape Canaveral, Florida. • Andrew Ruppenstein was the editor who published this page.